Our approach is simple. We understand that the body is a self healing organism. The Nervous System is the central command center for this program. If something interferes with the function of your Nervous System your body will not be able to do what it is designed to do. You will develop symptoms or aches and pains. My job as a Chiropractor is to remove whatever is causing the interference to your Nervous System. While we generally meet people after they’ve lost their health, our commitment is two-fold. 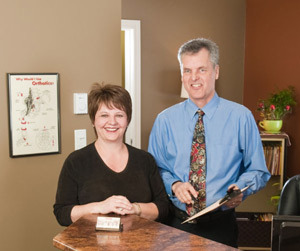 Welcome to Elmwood Chiropractic Clinic! Relief or wellness care… it’s your choice. Regardless of your health goals, please understand that we see ourselves as mere servants. You’re the boss! It’s your body, your health and your future. Our job is to offer you the finest chiropractic care possible in Moncton, make appropriate recommendations and work together to achieve your goals. Take the first step towards relief by calling our Moncton practice today and making an appointment to discuss your health goals.